There’s never a better time to take a vacation from your vacation than after all of those Thanksgiving calories. If you are looking for the best place to work off your Thanksgiving binge eating, a weekend at the spa — rather than Black Friday shopping — may just be what your body ordered. Thankfully, here in the U.S., we are blessed with many options that are up for the challenge. The folks at Canyon Ranch have been helping guests lose a few extra pounds from the get-go. Their luxury spa vacations and therapies are heralded throughout the country and each location provides a vast menu of health and fitness pampering. 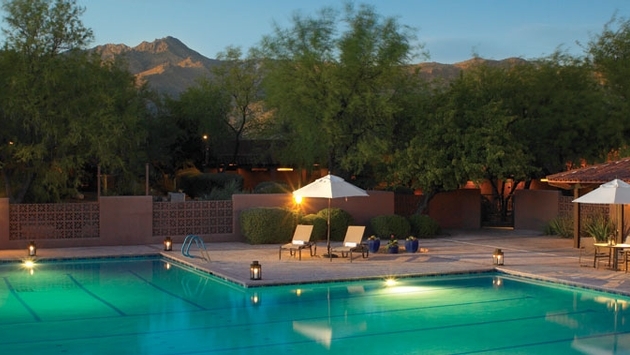 Canyon Ranch may just be one of the most accessible wellness spas with locations in Tucson, Ariz.; Lenox, Mass. ; the SpaClub in Las Vegas and SpaClub at Sea. So for those looking to lose the extra Turkey Day pounds, there really is no excuse. The New You Tucson Special is available through Dec. 23 and includes 20 percent off for first-time guests booking a stay of four nights or more. In San Diego, Calif., guests can truly lose themselves to a health and fitness routine at Cal-a-Vie. The resort offers a blend of European spa philosophies and California wellness traditions in a stunning setting. Perfect for those looking for a crash course in wellness after too much Thanksgiving enjoyment, the three-night package offers a “jump start” to a healthier you. It includes two 50-minute massages, reflexology, hydrotherapy, a facial, a hair and scalp treatment as well as unlimited fitness classes, nutritional lectures, cooking demonstrations and more. Located in Texas Hill Country, Austin’s Lake Austin Spa Resort has been recognized as a top wellness destination by Conde Nast Traveler and is one of the top 10 destination spas in the country, according to Travel + Leisure, which is why recovering from Thanksgiving’s calorie fest is best done here. Stays include three healthy meals daily, luxurious accommodations and a wide variety of fitness classes such as yoga, stand-up paddle boarding, cycling hiking and more. If you are gearing up for the holidays and the New Year, start off on the right foot with Lake Austin’s Resolution Week. The package includes the opportunity to re-energize your mind, body and spirit with live music, storytelling, culinary experiences, star-gazing, soul strolls and more.